WASHINGTON (CNN) -- Democrats hold a strong majority in Congress, but with power comes a power struggle, and a potential headache for President Obama. 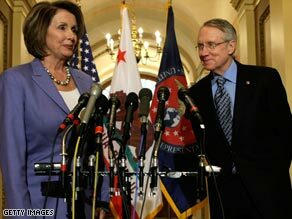 Nancy Pelosi and Harry Reid have made it clear that they don't agree with President Obama on everything. Just two days into his term, the president is already facing pushback from leaders of his own party. House Speaker Nancy Pelosi and Senate Majority Leader Harry Reid have made it clear -- it's not their job to answer to Obama. To a certain degree, the president-Congress tension is simply politics at play -- something that happens every time a new president comes in. But this time, the Democrats have even more power than they did before the election, meaning Pelosi and Reid both have huge majorities in their respective houses. Pelosi's biggest problem with the president's agenda is the silence she's hearing when President Obama is asked about former President Bush's tax cuts. During the campaign season, Obama proposed repealing the Bush tax cuts on those making at least $250,000, but now it's more likely that the president will delay any tax increases on the wealthy until 2011, when the tax cuts expire. The Obama team says that in the middle of a recession you don't, in effect, raise people's taxes. Pelosi, however, doesn't buy that argument. She wants to see them rolled back now. "We had campaigned in saying what the Republican Congressional Budget Office told us: Nothing contributed more to the budget deficit than the tax cuts for the wealthiest people in America," Pelosi said in an interview Sunday with Fox News. A spokesman for Senate Minority Leader Mitch McConnell called Pelosi's statement "false," and cited a recent fact check by the St. Petersburg Times disputing the House Speaker's claim that tax cuts for the wealthy are the biggest contributor to the budget deficit. Pelosi said she would not seek to block the president's proposed stimulus plan over its lack of tax hikes for the rich, but she urged Obama not to simply let the tax cuts expire in two years. "[Tax cuts on the wealthy] have to prove their worth to me as to how they grow the economy, how they create jobs," she said. Pelosi is also pushing for an investigation into the Bush administration's handling of the Justice Department, while Obama and his aides say there are other priorities besides focusing on the administration they are succeeding. "I think that we have to learn from the past, and we cannot let the politicizing of, for example, the Justice Department, go unreviewed," Pelosi said last weekend. "Past is prologue." Before becoming president, Obama made it clear that investigating the Bush administration wasn't a priority. Over in the Senate, Reid has taken a similar stance to Pelosi's. In an interview with The Hill earlier this month, the Democrat said, "I don't believe in the executive power trumping everything. ... I believe in our Constitution, three separate but equal branches of government." Obama, however, has made clear he's not letting any pushback slow him down. Even before his inauguration, he threatened to veto any attempts to block his access to the remaining bailout funds. As the Obama administration gets settled in, one can expect the tug and pull between the White House and Congress to continue: It's that balance of power getting into balance under new circumstances.